Today is the last day of National Craft Month. 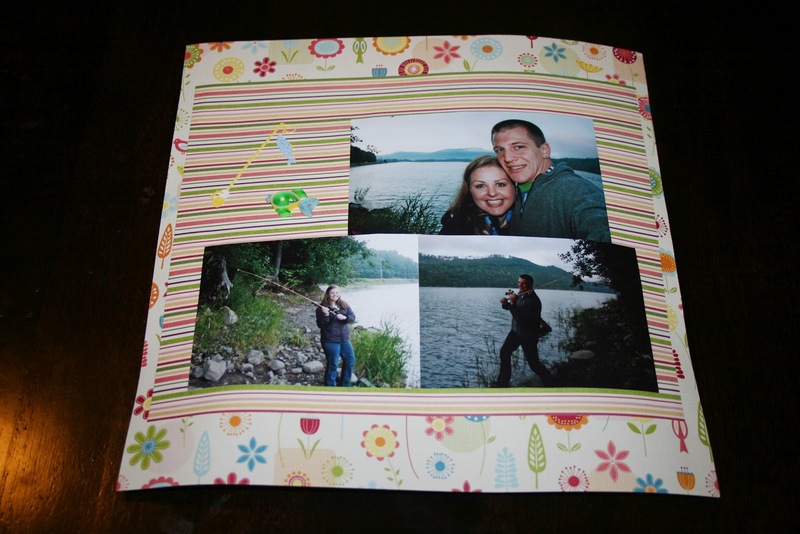 It's been a really fun month of crafting and blogging! I am a little sad to see it ending...not that it means I will stop crafting/blogging, but I won't be quite as driven. I have to admit that when I first committed to one project a day, I was a little apprehensive and unsure if I would actually be able to complete the task. I'm glad that I did though! I wanted to honour the one constant supply that has been used for every single one of my posts: my camera. I have a DSLR camera that I absolutely love, but the camera strap that it came with is really not the most comfortable. It often rubs my neck until it's red and achy. So, I decided to change that. My husband and I both hold and use the camera. 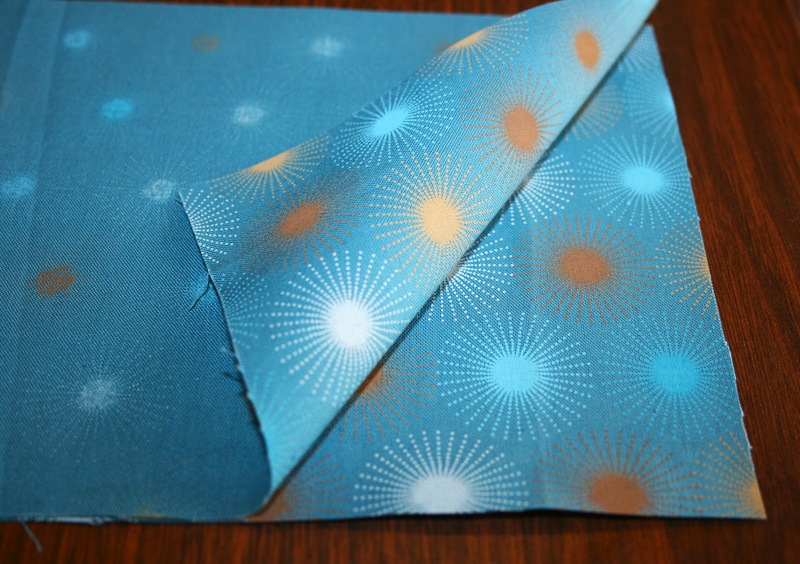 Therefore, I decided to forgo the fancy pink fabric that I was originally leaning towards and picked a funky blue pattern that he would also like. :) First, start by ironing the fabric. 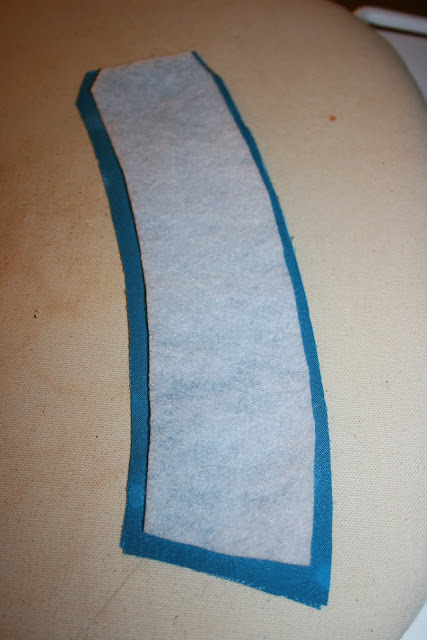 Then cut the fabric and fusible fleece to the correct lengths. Put the two pieces of fabric together with the RIGHT sides together. 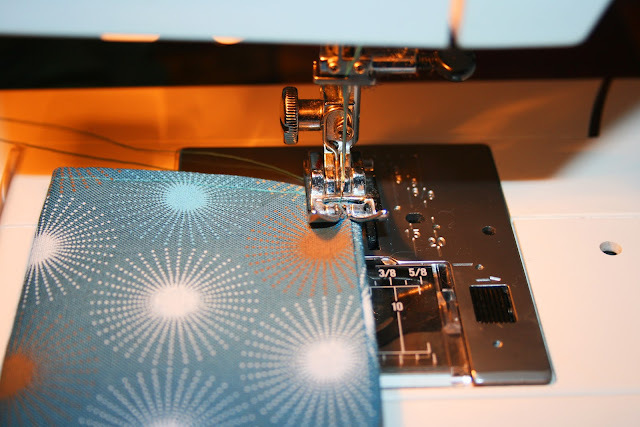 Thread your sewing machine with the coordinating thread. 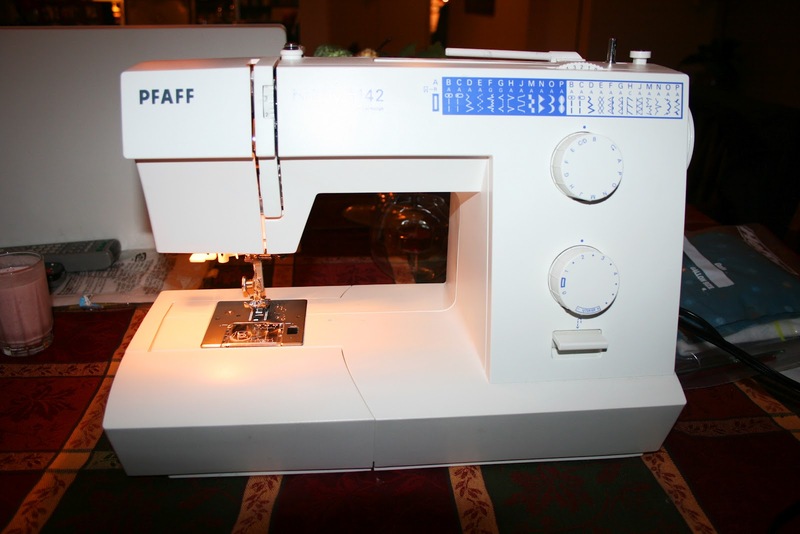 Sew three sides of the fabric - both long sides and one of the shorter sides. Then iron the fusible fleece onto one of the sides. Let it cool completely, then flip it inside out so that the RIGHT sides are on the outside. Then fold the fabric on the last edge into the tube, about 1/8 - 1/4 of an inch. Then iron the seam. 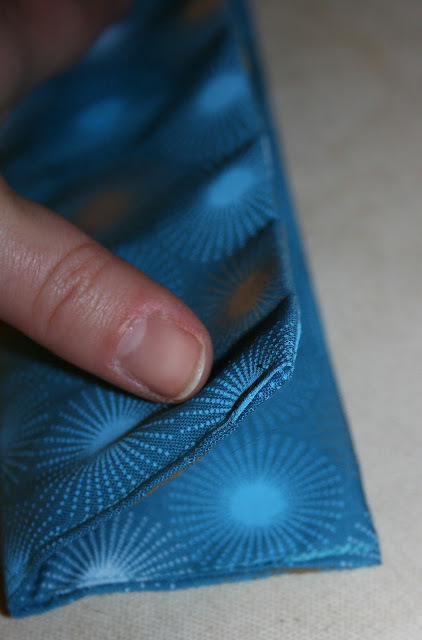 Sew that last edge together. Then fold it in half lengthwise and iron. 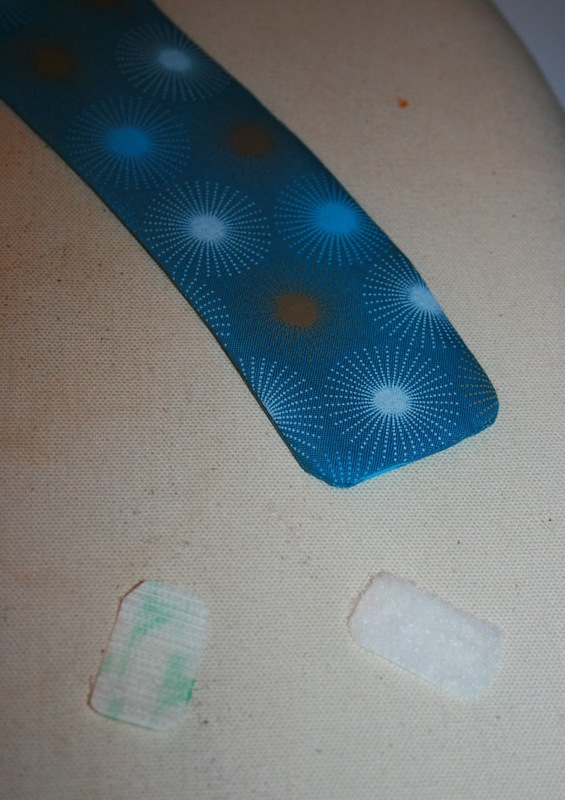 Then sew the long edge together. I tried to keep all my edges about 1/8 inch, just for personal preference. 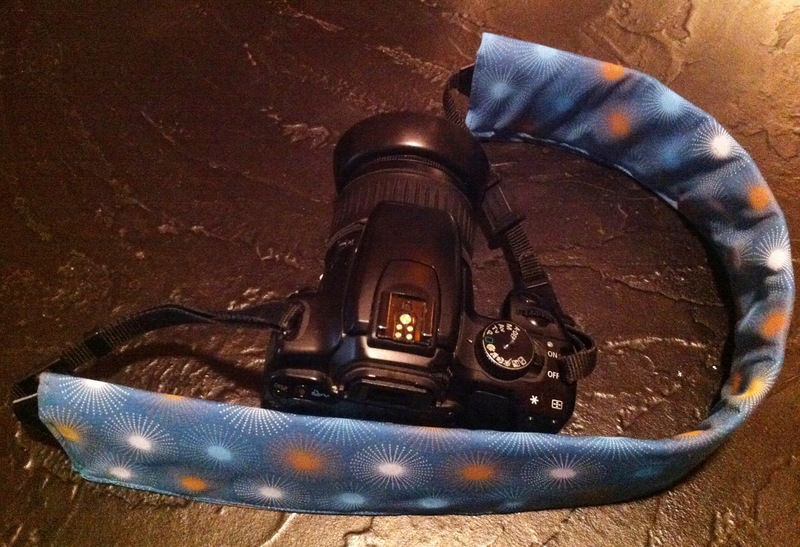 Then your camera strap is complete! 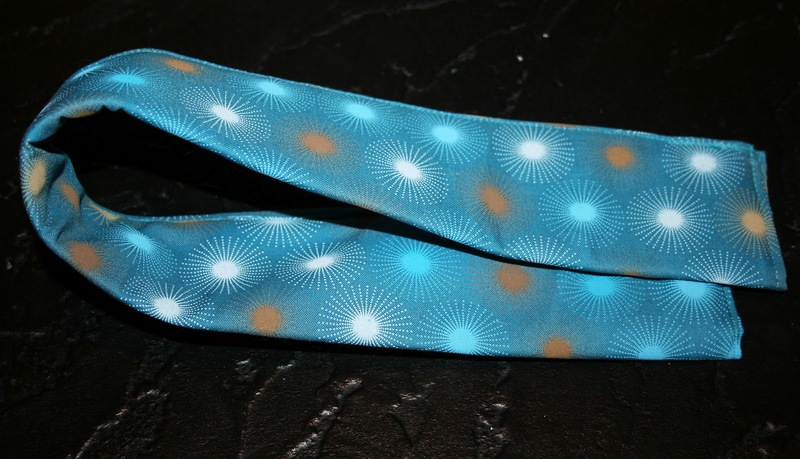 Just slide the strap over your DSLR strap and enjoy! I had to take this last photo with my phone because, well, my camera was the subject of the photo! In honour of being in the beautiful Northwest right now, I decided to do a region-inspired craft. Seattle is the home of Starbucks coffee, of which I happen to be a fan. And when I visit Seattle, it is a must-splurge. I got the pattern for my coffee cozy here. 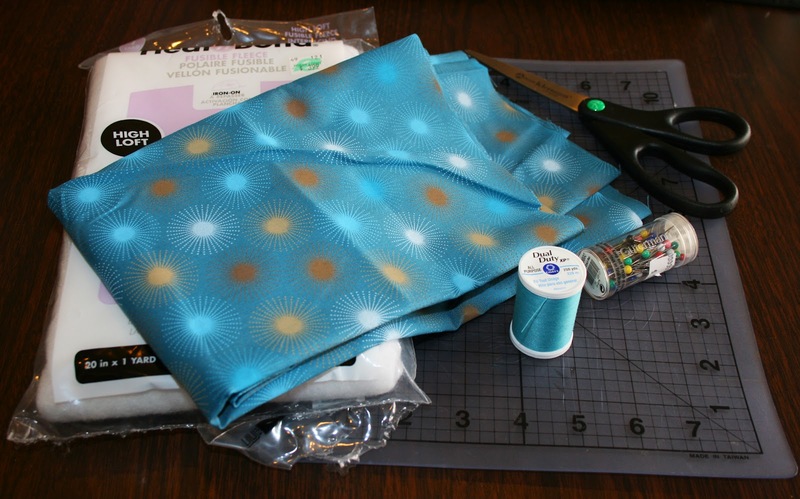 First, start by cutting two cozy pattern pieces from your fabric and one piece of fusible fleece. 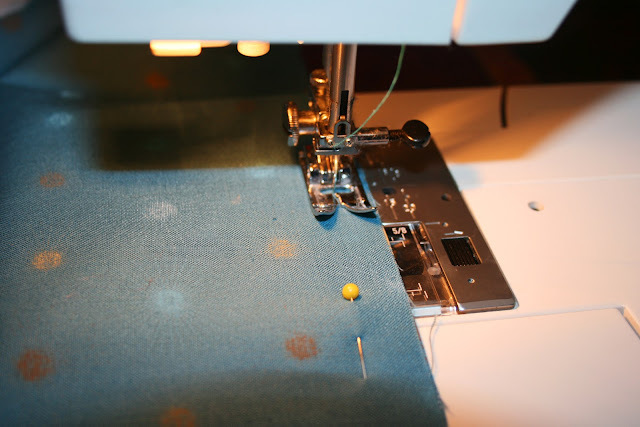 Iron the fusible fleece to one of the fabric pieces, on the WRONG side of the fabric. 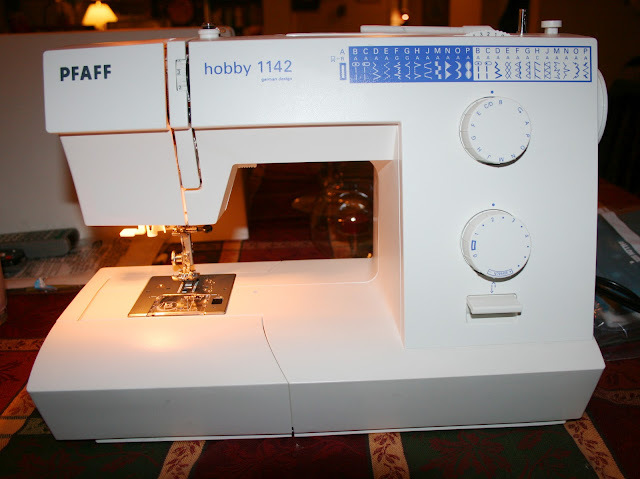 Set up your sewing machine (or, in my case, your mother's sewing machine) with your matching thread. Put your fabric pieces, RIGHT sides together. Then sew along both of the two long sides and the tapered short side. Then flip it right side out. Next, fold the fabric into the center on the non-tapered short side. Iron so you get a seam. Then sew that edge shut. 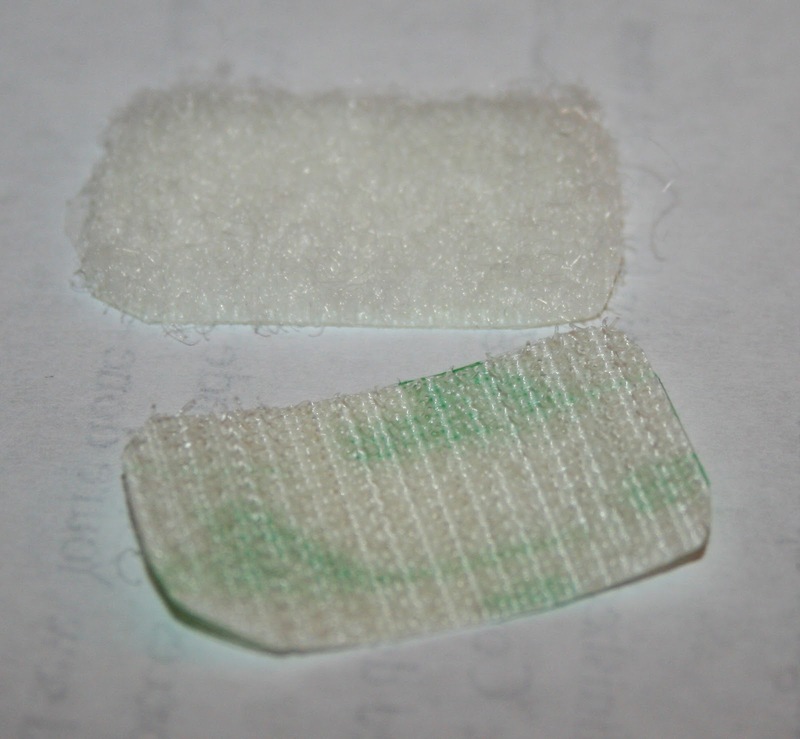 Next, cut a small strip of velcro, and round the edges so it doesn't pull up. 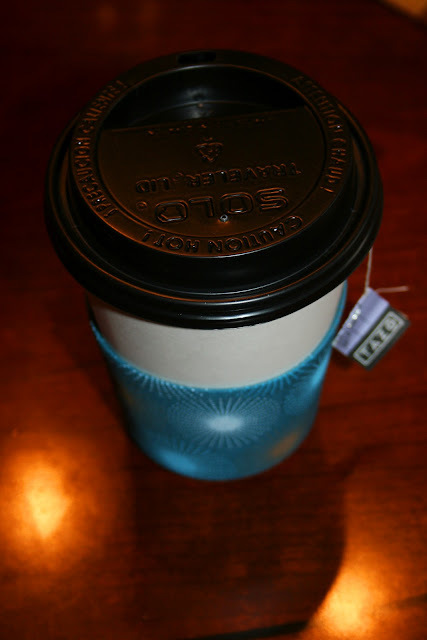 Wrap around your coffee cup and enjoy! It's very soft and comfortable...and cute! 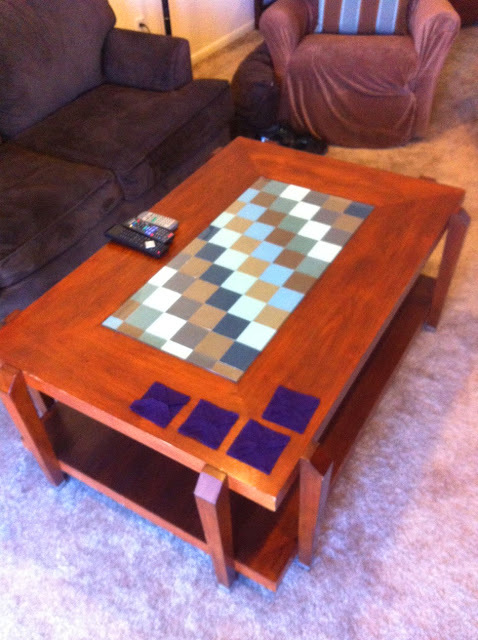 We just bought a coffee table. It was used and owned by one of our neighbors, but it was still in really good shape. We got it for only $20! And, it's real wood (not particle board), 4 feet long and 2.5 feet wide! It's PERFECT for our large living room. my husband and I don't like the look of the glass. 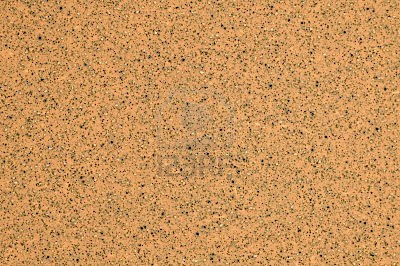 Originally, we were thinking of replacing it with a decorative floor or backsplash tile. We went looking at several different stores but struggled to find one that was the right size, colour, width and price. Nothing was working. Then we cut out a cardboard section from our vacuum box, so that it would slide perfectly into the slot for the glass. 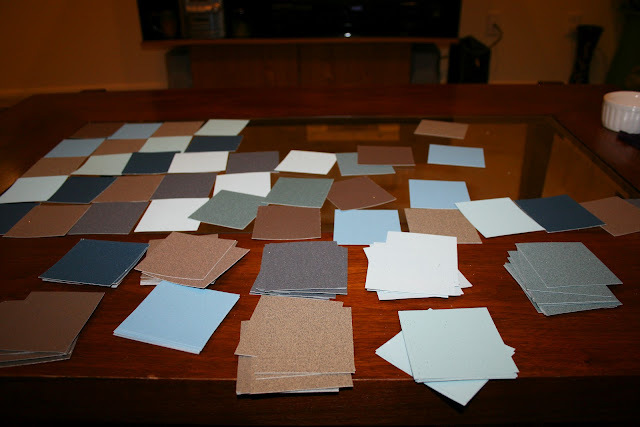 After that, we mod podged the paint swatches onto the cardboard in a diagonal pattern. Then put one coat of mod podge over all of them. Let dry completely. 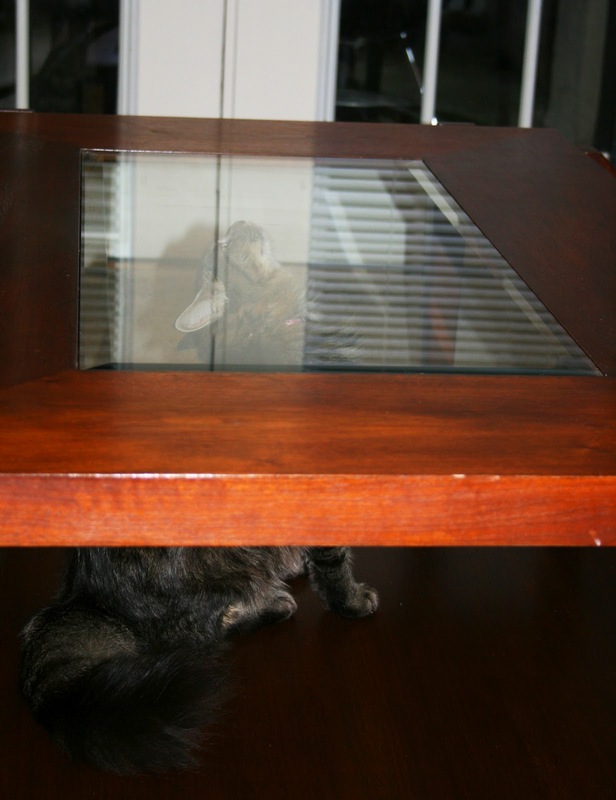 Then we placed the glass on top, to give it more stability than just the cardboard would have, and voila. And remodeled coffee table. :) We are still thinking about staining it a darker wood colour, but for now we are really happy with how it turned out! I have had big plans to create a scrapbook with all of our honeymoon photos (we went to Mt. Rainier). I hadn't gotten around to it yet...so I figured 8 months into my marriage was as good a time as any to get started. 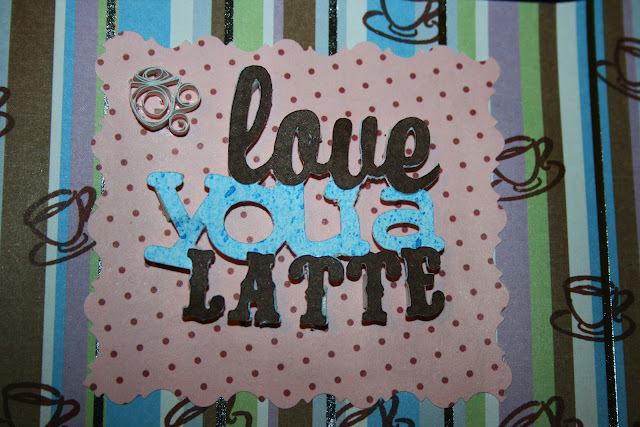 :) And since I just created two quilled items a couple days ago (directions here) I decided to incorporate those into my designs. 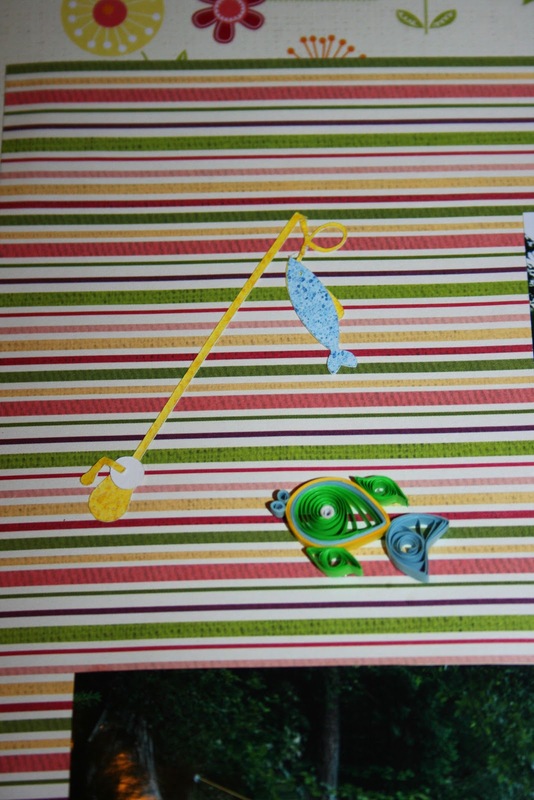 My first page was for our fishing day. It was so much fun! The day before our excursion, we went into town and bought a few licenses and poles. Then the day of, we woke up super early, packed a yummy picnic breakfast, and headed on our merry way. 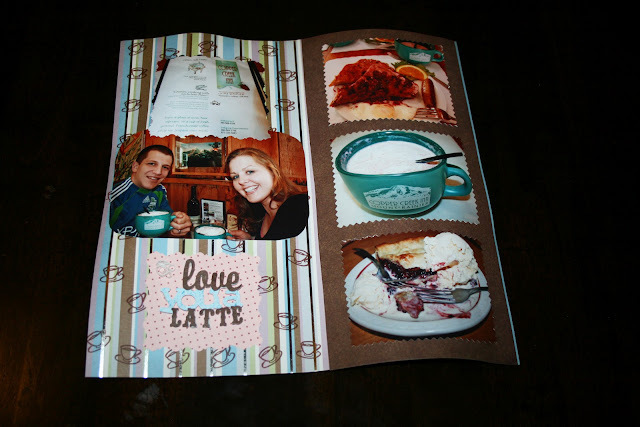 My second page was about our "blackberry extravaganza". We were told that there was a restaurant that we absolutely MUST TRY for their blackberry goodies, called the Copper Creek Inn. We headed there for breakfast on our last day, and it didn't disappoint. We each ordered a blackberry latte, split the blackberry french toast breakfast, with eggs and sausage. and then split the blackberry pie a la mode. (Yes, we were aware that it was breakfast and we shouldn't have dessert after a breakfast...but it was our honeymoon and we didn't care!) SOOOOO yummy!! 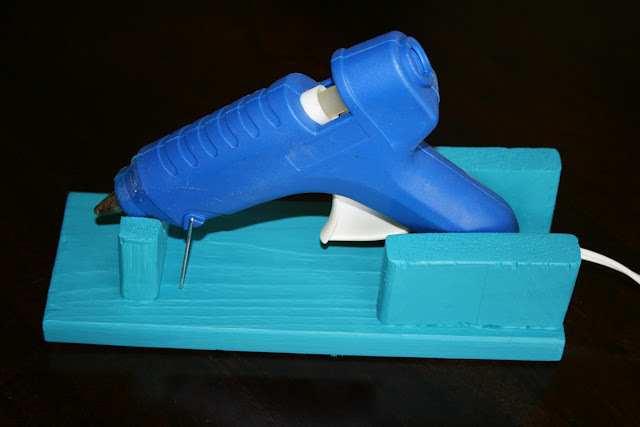 I don't know about you, but when I work with my hot glue gun, I always struggle with it. It has a mind of it's own! I try to set it down, and it just slides all over the place...sometimes tipping over; sometimes flying off the table....all the while getting glue strings everywhere. Not to mention the burning potential because of the super hot tip. It drives me bonkers. So I decided I needed to create a holder for it. First, start by cutting your wood to the appropriate sizes. This will vary depending on your hot glue gun. I have a smaller one, so my base piece is a little shorter than the length of a business envelope. Then cut the two side pieces, which will stabilize the handle, and the front piece, which will hold the gun's tip. 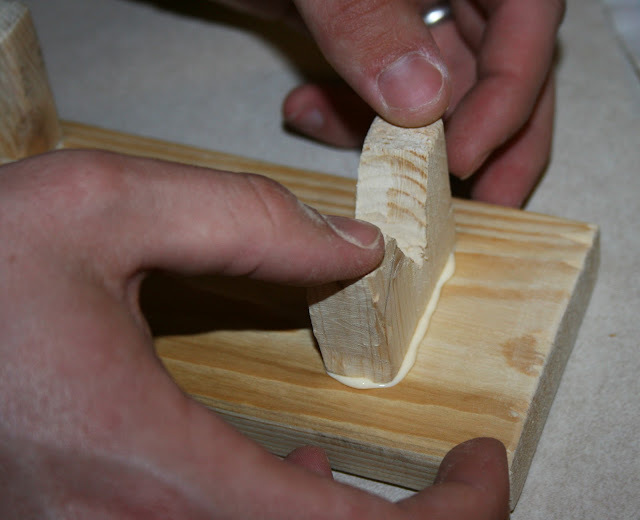 After that, use a Dremel tool to cut out a notch in the front piece of wood. 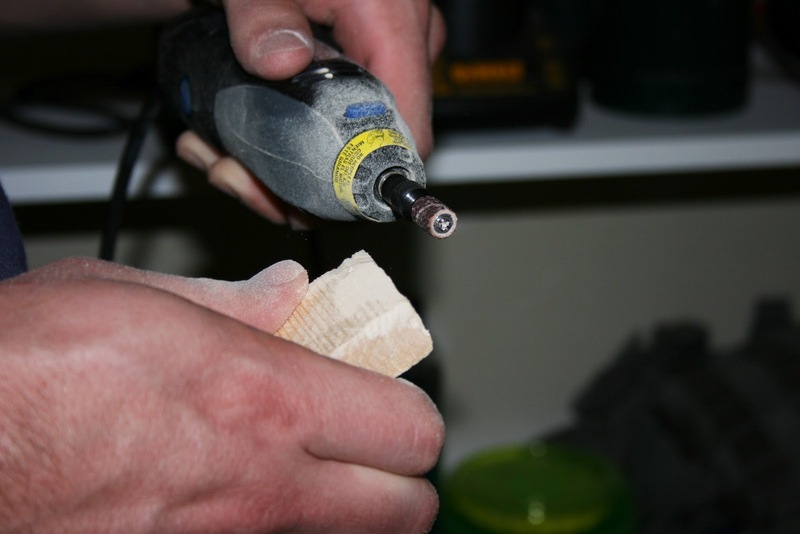 Make sure that the tip of your glue gun will fit securely into the notch. 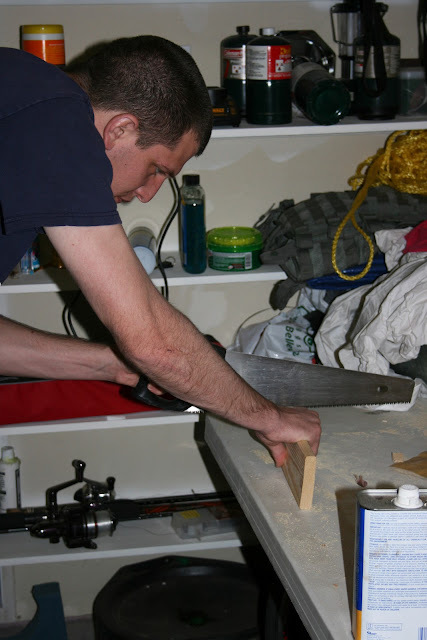 Then sand all the edges of your wood pieces so they are nice and smooth. Use wood glue to glue everything together. Let dry completely. Then paint it whatever colour you prefer. I just used leftover paint from previous projects. And you have your holder! 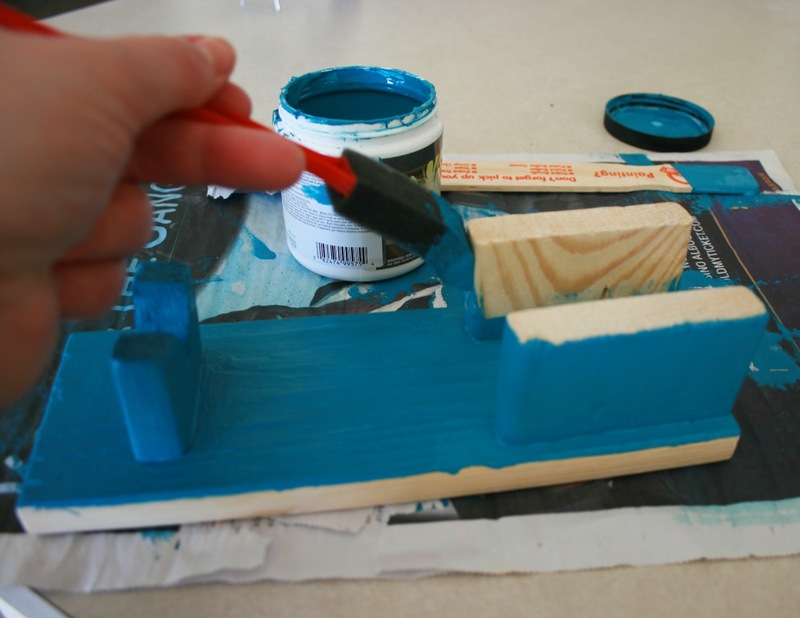 I wanted to go a step further because I was afraid the glue might drip out onto the wood, and would rip off the paint or layers of wood. 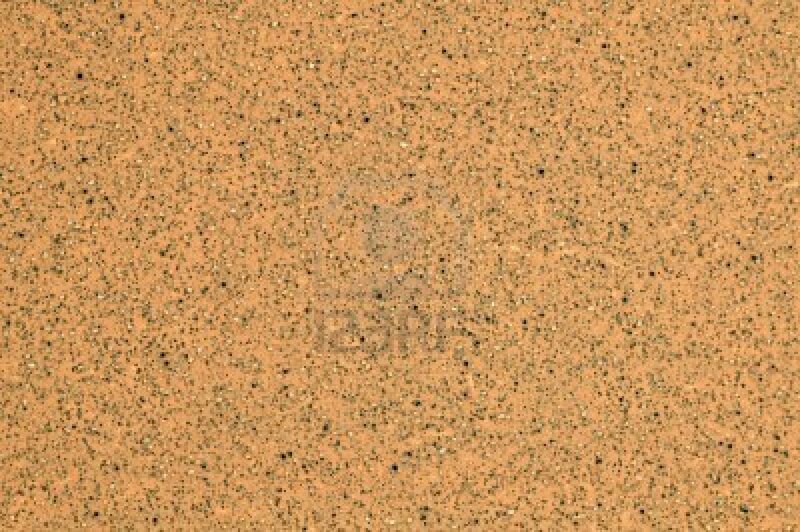 So, I went to Lowes and got a small scrap piece of tile for free. 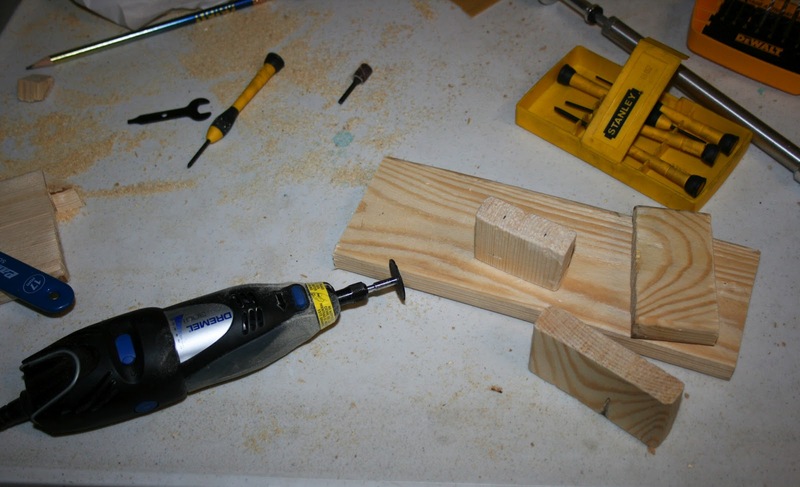 Then I super glued it to the wood under the gun's tip. 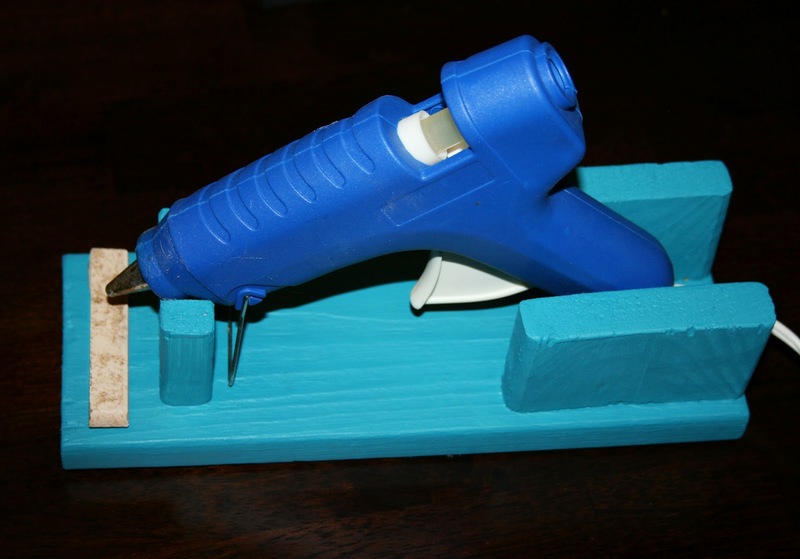 Now, you have a finished hot glue gun holder! :) Here's to easier (and safer) crafting projects in my future! March means NATIONAL CRAFT MONTH!